Lyme disease is caused by the bacteria Borrelia burgdorferi. People can get Lyme disease if they are bitten by a black-legged tick that is infected with this bacterium. This tick is often found in areas with high populations of deer. Rash: About 80% of patients with Lyme disease will have a rash called erythema migrans. The rash can appear between 3 and 30 days after the tick bite. The rash occurs at the site where the tick bite happened. The rash is most often circular and expands over a period of several days; it can reach up to 12 inches across. As it expands, the center of the rash may get lighter in color, so the rash can look like a bull’s-eye. Flu-like symptoms: fatigue, chills, fever, muscle and joint aches, and swollen lymph nodes. If not treated with antibiotics, Lyme disease can spread to the joints, the heart, and the nervous systems. One symptom that can occur is loss of muscle tone on one or both sides of the face. This is often called facial palsy or Bell palsy. Lyme disease is diagnosed by noting symptoms and physical findings such as the rash. Another important part of diagnosing Lyme disease is considering where the patient lives. Certain states and counties within the United States, such as in the Northeast and upper Midwest, have higher rates of Lyme disease. In these areas, doctors may have a greater concern for Lyme disease in patients with symptoms such as rash, fever, or facial palsy. A study in this month's Archives showed that including information about geographical location in the diagnosis improved the doctor's ability to diagnose Lyme disease. A blood test for Lyme disease can be done if the diagnosis is not clear. Lyme disease can be treated with antibiotics for a few weeks. Patients diagnosed as having Lyme disease early in the illness and treated quickly generally recover without any further problems. Prevention of Lyme disease includes preventing tick bites. Ticks are most active in May, June, and July, so these are times to protect your children carefully. Ticks prefer wooded and bushy areas with high grass, so these are areas to avoid. If walking in areas such as these, stay in the center of the trail. Create a “tick-free zone” around playground equipment in your yard by moving leaf litter and brush away from areas where your children play. Pesticides and insect repellents can be helpful in geographic areas with large numbers of ticks. If you find a tick on your child, remove it carefully and call your physician to discuss whether testing or treatment is appropriate. 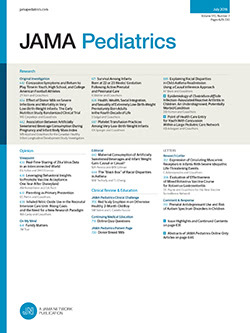 To find this and other Advice for Patients articles, go to the Advice for Patients link on the Archives of Pediatrics & Adolescent Medicine Web site at http://www.archpediatrics.com. The Advice for Patients feature is a public service of Archives of Pediatrics & Adolescent Medicine. The information and recommendations appearing on this page are appropriate in most instances, but they are not a substitute for medical diagnosis. For specific information concerning your child's medical condition, Archives of Pediatrics & Adolescent Medicine suggests that you consult your child's physician. This page may be photocopied noncommercially by physicians and other health care professionals to share with patients. To purchase bulk reprints, call 312/464-0776.